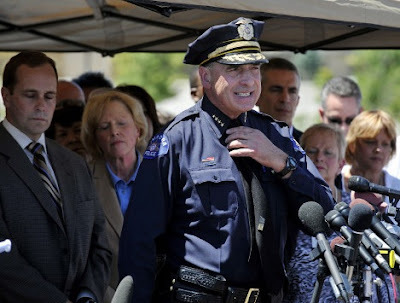 Body Language & Emotional Intelligence: Nonverbal Communication Analysis # 2053: Strong Signal of Fear-Sadness Anxiety - Aurora, Colorado "Batman Shooting"
Aurora, Colorado Police Chief, Dan Oats is seen here at a press conference yesterday exampling what is known as the "false tie adjust". It is a very reliable body language signal of anxiety - and more specifically a fear-sadness sub-type (In this context it also is suggestive of empathy). Also known as the "Manubrial-Touch", it is seen both in sexes - with women often touching/moving/holding the pendant of their necklace. Variants of this nonverbal are also seen when there is no tie or necklace present - with a touching/rubbing/scratching of the upper portion of the sternum - the manubrium. Chief Oats also has a classic nonverbal expression of fear displayed with his mouth. While he may not enjoy press conferences or speaking in public, he is for now one of the mouth pieces regarding the tragic shooting in the early morning yesterday. Most everyone fears being the bearers of bad news. Notice also how many people behind him have their eyes closed. This is not coincidence. One reason for prolonged eyelid closure is emotional processing. It's a body language signal that one's emotions are trying to catch-up to reality and what the "logical brain" already knows. Thus it is common to see prolonged eyelid closure (and eye covering with the hands) during times of fear. What do you think former White House Press Secretary, Dana Perino is Thinking-Feeling?